My grandmother has been making this delicious recipe for Christmas afternoon gatherings for as long as I remember. Already a huge fan of apricots, this is by far my favorite thing she would serve. This year she was unable to make them, and so I offered to make them since it would also be a great recipe for this blog. They were so good that I made the recipe twice in one week over the holidays—and again last week since I needed to retake some photos since I over chopped the apricots on the second batch. One thing that surprises most people about this recipe is how little fat is in it. If you opt to skip the frosting (which is mostly cream cheese), it comes down to 1 egg and 4 tablespoons of butter per loaf of bread and that’s it for the fat content. Tasting the bread you would never be able to tell it was this healthy. The apricot bits go a long way to giving the bread some body and depth along with a nice tangy zing. I really don’t care about things being low fat, but I mention this since I know there are many who do. 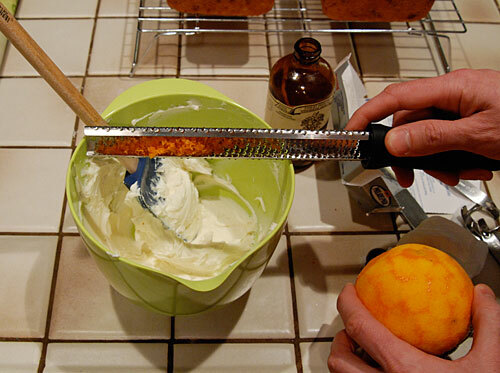 The frosting has a great orange flavor thanks to some orange zest and is a must in my opinion. I made a batch for a New Year’s Eve party and some of the guests were so enamored with these that they insisted that I sell the bread to Starbucks. I brought the latest batch into work and people were genuinely surprised at how good they were. Some were expecting a dry fruitcake given the appearance of apricot bits and were pleasantly surprised to find how moist and delicious these are. Although it may look like a bit of work from the abridged set of photos below, the use of a food processor goes a long way towards making these pretty easy to make. 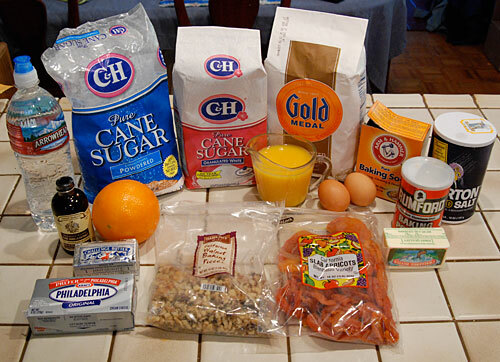 Ingredients for making Apricot Bread. 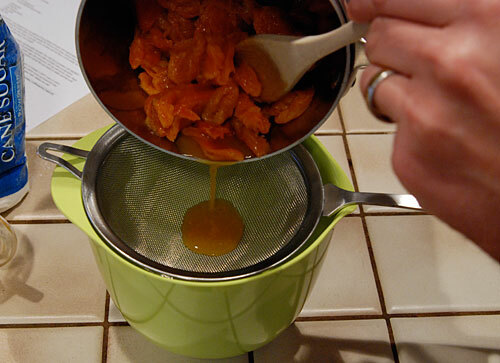 Hydrate 11 ounces of dried apricots in 2 cups of water. Heat over medium heat until water is simmering, stirring occasionally. Remove from heat and let soak. 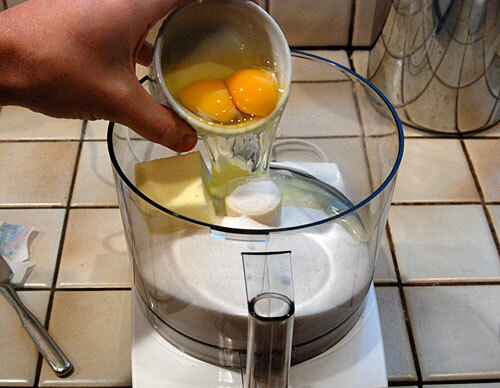 Combine 2 eggs, 1/2 cup of butter and 2 cups of sugar in food processor and process until smooth. 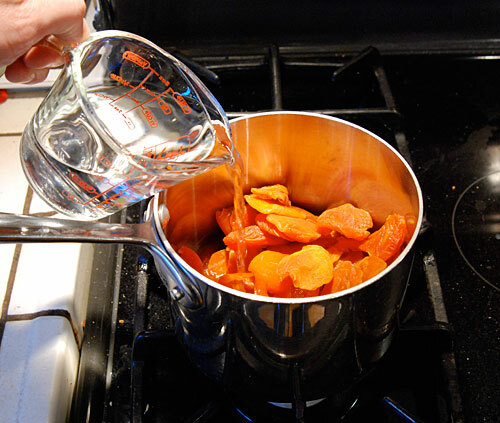 Strain the apricots and reserve 1/2 cup of the water. 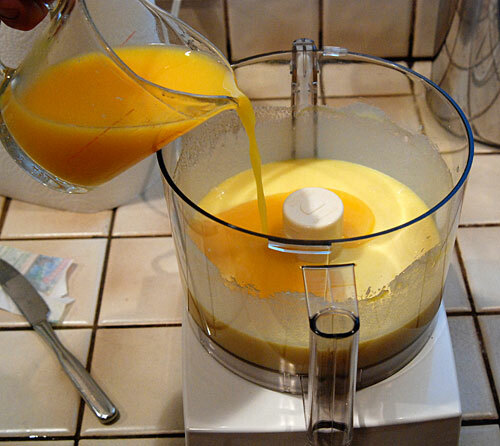 Pour 1 cup of orange juice to into food processor with 1/2 cup of the apricot water you strained. 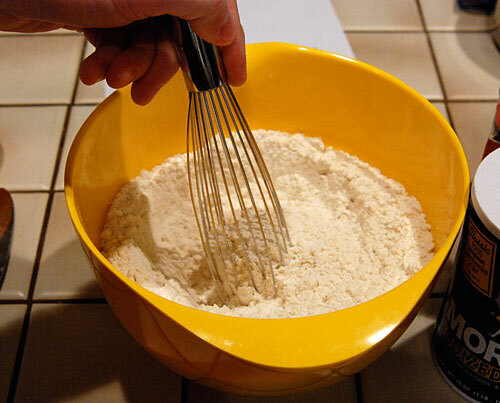 Combine 4 cups of flour, 4 teaspoons of baking powder, 1/2 teaspoon of baking soda and 2 teaspoons of salt and stir until blended. 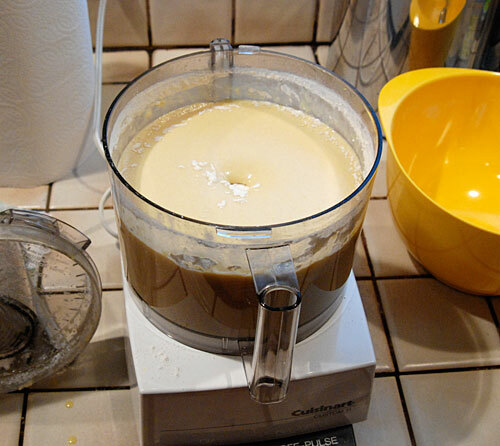 Dump dry ingredients into food processor and pulse until just blended. 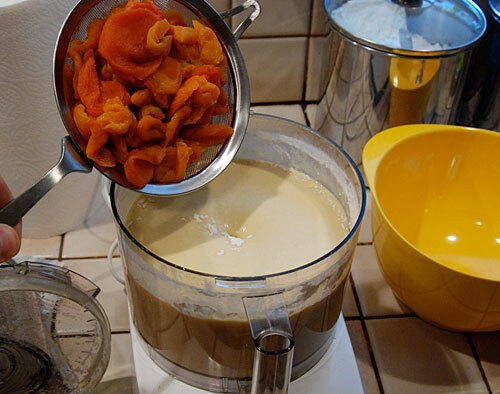 Add hydrated apricots and carefully pulse processor only just until pieces are chopped. 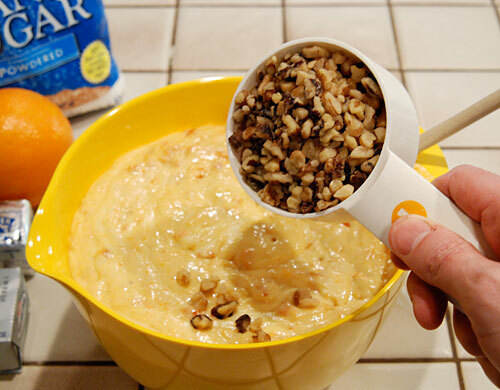 Add 1 cup of chopped walnuts and fold until blended. Grease two bread pans and line botoms with greased wax paper. Non-stick spray with flour works great. 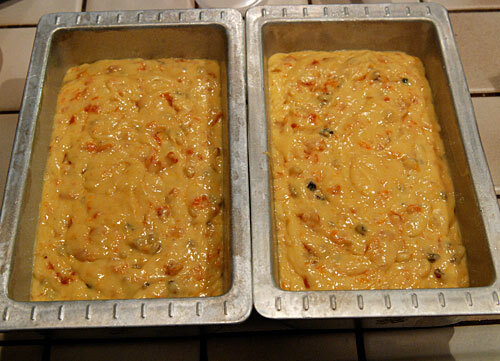 Spoon dough evenly into each greased bread pan and let rest for 20 minutes. You can preheat oven to 350° F while it rests. Bake in 350° F oven for 55 – 60 minutes. 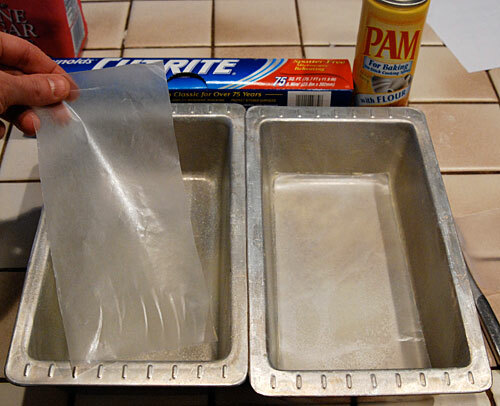 Immediately remove from pans, remove wax paper and transfer loaves onto wire rack to cool. 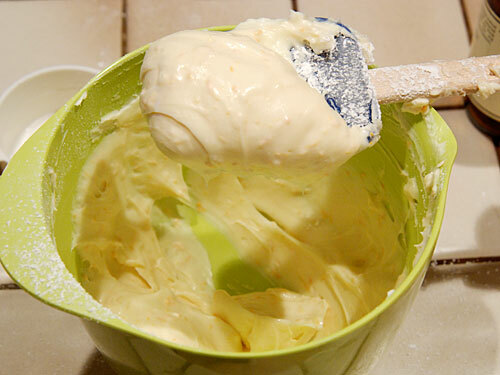 Cream together 8 ounces of room temperature cream cheese, 1 tablespoon unsalted butter, 1/2 teaspoon vanilla extract, 1/2 cup sifted powdered sugar and 1 tablespoon of orange zest. 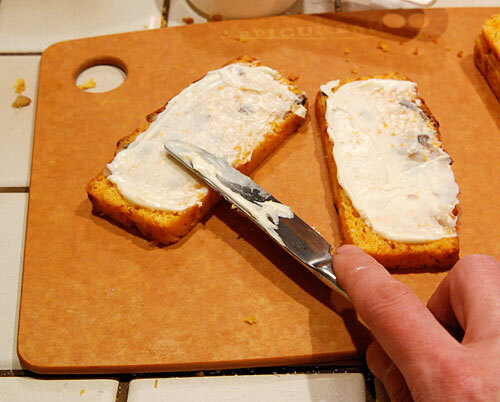 Once bread has cooled, slice and spread frosting on one side of two slices before pairing to make a sandwich. Serve slightly chilled. 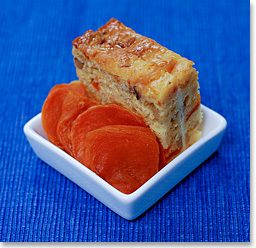 The recipe pictured above, with detailed instructions and photo gallery can be found on the Apricot Bread recipe page. This entry was posted on Sunday, January 18th, 2009 at 8:22 pm	and is filed under Cupcakes & Muffins. You can follow any responses to this entry through the RSS 2.0 feed. You can leave a response, or trackback from your own site. I did go through all your chocolate writeups and think your chocolates are a work of art. My cousin tells me that your bakes are also very good, because she got to try them at her neighbour’s who is a viola teacher. In fact, she sent me the link to your site. Hi Aparna, the cream cheese filling adds some orange flavoring and is mostly cream cheese, so I’d still encourage giving it a try, but the bread is also good on its own. You must be related to Ashvin, who lives next door. We saw his family at New Year’s and I served these. Thanks for stopping by! Thanks, I’ll give it a try sometime soon. Yes. Ashvin’s mum is my cousin. I love the photographs for each step! This will be really helpful. Nice blog and pictures. I think I’m going to cook this for my kids tomorrow. Your step by step pictures are very helpful! My wife and I really liked this article. I have used it a few times. I think a lot of people would benefit from it. You should post it on Wacanai. They get a lot of traffic on the website and you can link it to your page so it will get more people going to your website. You can search for similar articles and when you post your article it will show you other articles that you may like. It’s worth checking out. Thanks Mary, glad you liked the recipe. I’m not interested in reposting any articles since they are already available here. I went through half of your chocolate baked goodies recipes and I’m headbent on trying out two of them tomorrow. I’m going to have a bakefest in my own tiny kitchen! But this apricot bread makes me curious. Though it doesn’t look anywhere as decadent as your choco goodies, I’m pretty sure its delicious. 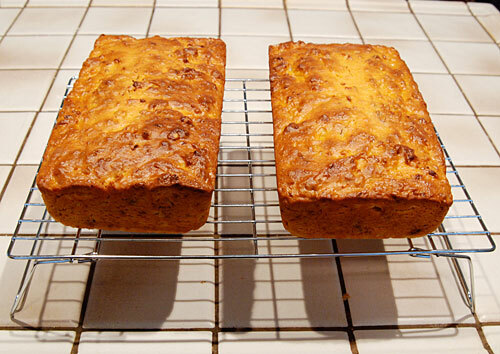 This apricot bread is surprisingly rich, but I agree, not as decadent as chocolate for breakfast would be! This bread looks like a gorgeous idea – I love apricots. And with the frosting filling..mmm I’m hooked! Hi Lucy, yes, the filling is one of the best parts–do not make the bread without it! I have to say, this is the first time I have ever heard of Apricot bread, and I’ve been making bread my whole life! 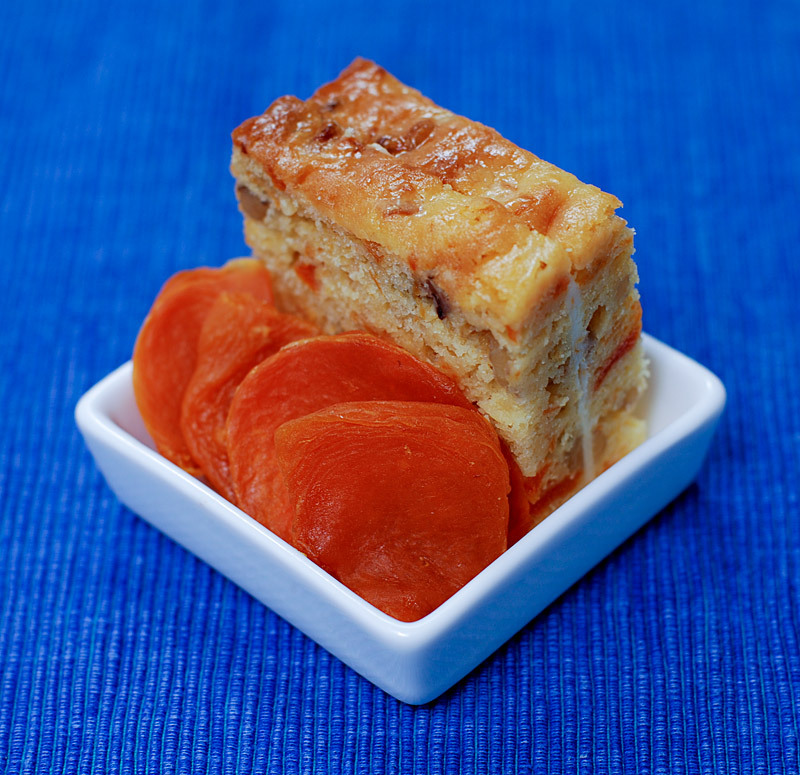 What a wonderful recipe, please thank your grandmother for me – the family loved it! I’ll be sure to pass along the feedback. 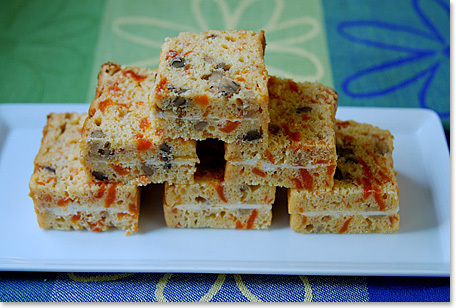 I love this recipe and was impressed with your site.